In the eternal struggle to understand how things came into being, there’s a lot of reading to be done. Reading flyers, street signs, bottle labels, book titles, names of people and places, words, paragraphs, sentences, parables, and prose—anything my eyes can settle on long enough for my brain to do something about it—be it for typographic nourishment, or, a little less commonly in my experience, to actually read the words. The distinguishing difference, however, is that I do much of this reading aloud. It’s a habit I picked up from my Dad. He’s done it for as long as I can remember. And when I really think about it, it is a strange thing to do. When I notice other people do it, they seem a little bit crazy. But there’s a definite meaning and art to it. Reading things aloud gives our brain a chance to parse things without the words getting in the way. That sounds a bit silly, but I’m sure you know what I’m talking about. It’s one reason we talk aloud to our friends about problems we’re having. You let your mouth do the remembering, while your brain does the understanding. There are brain words, and there are mouth words, and never the twain shall meet. So why read everything I see? I can’t speak for my Dad—it’s entirely possible he just does it because he likes words—but for me, it’s to better understand the world. How people think and arrange words. How people understand the syntaxes and rules of our language. And also because I like words. I like to think some of these phrases and words spattered across our environment sometimes have a deeper meaning than their immediate definitions would imply. This particular phrase has its origins in my life deeply associated with Jurassic Park, but even that occurrence is somewhat metaphorical. Life is unpredictable. You won’t know until it’s happened how close that scary or wonderful thing in your life is. 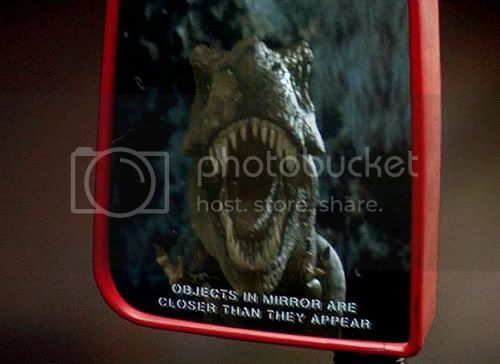 Or how close the T-Rex in your wing mirror really is. A fine mantra for any peaceful, fulfilling life, wouldn’t you think? Somewhat polarising to Facebook’s “Move Fast and Break Things” motto. I first saw this in a park in San Francisco, and it’s been etched into my mind since. There are two sides to every story. Always look both ways. Observe. Listen. Understand. This is my favourite one. I heard a Dad say this to his kid in Disney World. This little girl was walking hand-in-hand with her parents, when she stopped in the street to look at the floor. “You can’t just stop!” says Dad. Silently, the world applauds. These three short phrases picked up from just a walk down the street would make an excellent manual for living. Every person should have this list stuffed into their pocket once they reach a certain age. Toddlers, probably. Those kids need some good advice. Mouth words, as I’ve decided to affectionately name them, are the ones that tap into our lizard brain. Immediate dangers. Snap decisions. Tips to stay alive. Accepting the phrases above at face-value would make them mouth words. Brain words, on the other hand, are the ones that make us stop, sit down, and have a good, hard think. Why is this phrase this way? What am I supposed to take away from it? Who should I consult on the appropriate application of this advice? Is this person talking directly to me? Is that a T-Rex behind us? This might be overthinking street signs, but I have a feeling I’m not the only one who’s been following this line of logic. If I, as a reader, see these alternate meanings in every day signage, perhaps the creators themselves saw them. I know that if I was charged with coming up with the copy for a sign advising bikers to take caution when riding along a pavement1, I’d almost definitely take the opportunity to add a philosophical twist to the problem—if only to witness the catastrophe of hundreds of bikers stopping to ponder the deeper meaning of the sign. Maybe I’m being overly optimistic here, but if everyone on the Dropbox Design team, for instance, takes pride in the human touch intertwined into the work we put out, then I’d say the same is likely to be true for the street sign designers. I sure hope so. These words, like many products of design—be it flat-pack furniture or the grille of a train driver’s compartment2—are just as likely to have been the result of months of thinking around constraints as they are to have just been plucked out of thin air by a crusty creative director; but who’s to say that hoping for the former is a bad thing? A heavy bet on even a few street signs being more than the sum of themselves gives me another reason to find the human touch in my own work, and proudly tug it to the surface to bob along unrestrained. And that sounds like a very good thing to me.